The Killpecker Sand Dunes of the Red Desert support a wide range of wildlife and vegetation, ranging from elk who use the adjoining sagebrush steppe for shelter to aquatic organisms that thrive in snowmelt ponds. Photo by the Bureau of Land Management. The Red Desert is a high altitude desert and sagebrush steppe located in south central Wyoming, comprising approximately 9,320 square miles (24,100 square kilometers). 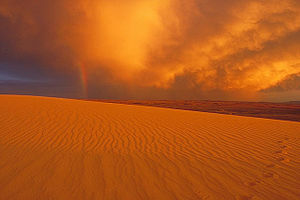 Among the natural features in the Red Desert region are the Great Divide Basin, a unique endorheic drainage basin formed by a division in the Continental Divide, and the Killpecker Sand Dunes, the largest living dune system in the United States. In the 19th century, the Oregon, California and Mormon Trails crossed the Continental Divide at South Pass, just north of the Red Desert. Today, busy Interstate 80 bisects the desert's southern region while gas field roads cross the desert. The Red Desert supports an abundance of wildlife, despite its scarcity of water and vegetation. The largest migratory herd of pronghorn in the lower 48 states and a rare desert elk herd, said to be the world's largest, live in the desert. Ponds fed by summer snow melt attract a wide range of migratory birds such as ducks, trumpeter swans[ citation needed], and white pelicans[ citation needed]. Herds of feral horses roam the area in large numbers, despite roundups and population control efforts by the BLM. Bison were also common and their skulls and horns can occasionally be found there. Melting snowpack is the primary source of surface water in Wyoming, such as this temporary wetland in the Muddy Creek Watershed of the Red Desert. Lake Gosiute began to fill the Red Desert for the first time in the early Eocene Epoch. Subsequent climate and tectonic activities during the lake's lifespan (four million years) saw repeated patterns of rising and falling water levels. Gosiute reached its maximum surface area of 15,000 square miles (39,000 km2) with its shoreline stretching into Utah. During other times the lake evaporated completely. Summer rains produce standing water in the desert, which supports wildlife, such as pronghorn, deer, and birds. The Continental Divide branches to the desert's northwest and rejoins in the southeast, creating the Great Divide Basin, from which no surface water drains. Steamboat Mountain and other desert mesas or buttes provide seeps and springs that serve as water sources for small streams, such as Jack Morrow Creek. While the basin's interior waters are intermittent, the desert is bounded to the west by the Green River and to the east by the North Platte River. Steamboat Mountain, overlooking the Killpecker Sand Dunes, provides habitat for desert elk. The Big Sandy and Little Sandy Rivers northeast of Rock Springs, Wyoming where large volumes of sand accumulated on their banks during glacial melting from the Wind River Mountains. Westerly winds that during the past 20,000 years have moved the sand eastward across the continental divide to its present location. Blowout grass, Indian rice grass, needle-and-thread grass, prairie sandweed, rusty lupine, salina wildrye, sand lovegrass, sand muhly, sandhill muhly, and scurfpea. Such plants help stabilize the sand by slightly reducing ground-level wind velocity. Stabilization is a cumulative process. Eventually the dunes may become stable as plant cover increases—assuming disruptive forces such as drought, fire, livestock and human traffic are not present. Dune beetles and other insects in addition to small mammals such as shrews, white-footed mice and kangaroo rats inhabit the dunes. Their presence attracts owls, eagles, bobcats and other predators. Moreover, an oasis of short-lived summer ponds that occur in swales at the base of the dunes support migratory shore birds and waders, as well as large game animals such as elk. Cattle, sheep, and free roaming wild horses also frequent the ponds. The fresh water also provides a habitat for aquatic organism such as salamanders and freshwater shrimp. Active sand dunes within the 10,500 acres (42 km2) of the Killpecker Sand Dunes area are open to off-road vehicles. Motorists are required to avoid the fresh water ponds scattered throughout the dunes. What the desert lacks in concentrated animal habitat, it makes up in expanse. The Red Desert is home to the largest unfenced area in the continental United States. Nearly three-quarters of the area is covered by sagebrush grassland. Sagebrush is a critical habitat for a variety of wildlife ranging from pronghorn which browse it year round to small insects. However, habitat is constrained by oil and gas roads along with drilling and mining. Sagebrush also provides cover for animals such as elk and the pygmy rabbit. Elk depend upon tall brush near Steamboat Mountain for shelter during spring calving season and elsewhere for shade during the heat of summer. Yet the broader impact of sagebrush upon the ecology is its function as a living snow fence. Windblown snow builds up on the lee side of the brush during winter. This effectively stores moisture that is released into the soil in late spring and early summer. Unbranded and unclaimed horses on public lands in the Red Desert are protected by the Wild Free-Roaming Horses and Burros Act of 1971. High above the desert floor, the Ferris Mountains and Green Mountains rim the Red Desert to the northeast. The mountains' boreal environment reaches as high as 10,037 feet (3,059 m), in the case of Ferris Peak, and supports snowshoe hares, red squirrels, and pockets of big horn sheep. The high elevation with its cooler summer range attracts elk and mule deer. Prairie falcons, northern harriers and other raptors soar along mountain ridges and canyon rims looking for feed such as migratory mountain plovers, a small ground bird. The mountain plover is one of three species protected by the Endangered Species Act present in the Red Desert. The bald eagle and the black-footed ferret are also listed. However, the bald eagle is seldom seen in the desert because of the lack of streams or lakes with accompanying fish. Black-footed ferrets, which feed upon prairie dogs, are also rare. A truck hauling coal for the Jim Bridger Power Plant near Point of Rocks, Wyo., dwarfs a nearby wild horse. The Red Desert's ranching industry includes remote cattle and horse ranches. Generations of American families, beginning in the 1840s, also left their mark upon the desert as they migrated westward along emigrant trails. The environmental impact of an estimated 350,000 pioneers and their wagon trains traveling through Wyoming between 1841 and 1868 is still visible today. In some cases, such as at Guernsey, wagon wheels wore ruts deep into solid sandstone. However, most trail ruts are less dramatic but still evidence of a people's history worn into the earth. A westward-looking nation in 1869 united its eastern and western shores with the First Transcontinental Railroad, whose route traversed the Red Desert. University of Wyoming historian Phil Roberts described the notion of building a transcontinental railroad as "today's equivalent of the mission to Mars: Big, expensive and impossible". The preliminary survey for the railroad produced the first map of the Great Basin and Southern Wyoming, according to author Stephen E. Ambrose. The Red Desert's lack of water presented a problem for steam locomotives of the time. The Union Pacific Company found reliable water by drilling deep artesian wells in the desert. Some of these railroad wells, such as at Wamsutter continue to supply much needed water today for residents and the influx of oil and gas field workers who live in temporary housing or "man camps". ^ "Desert Values". Friends of the Red Desert. Archived from the original on 2006-02-23. ^ a b "Wyoming's Red Desert and the Pronghorn". National Wildlife Federation. ^ "Pipeline plan takes shape". Casper Star Tribune. March 31, 2009. ^ "Killpecker Sand Dunes". Public Lands Information Center. ^ a b c Knight, Dennis (1996). Mountains and Plains: The Ecology of Wyoming Landscapes. Yale University Press. ISBN 978-0-300-06856-6. ^ a b c Steve Dudley. "Wyoming's Red Desert is an amazing place". Cheyenne, Wyoming: Wyoming Tribune-Eagle. Retrieved May 19, 2015. ^ "Site Profile: Red Desert". Audubon. Archived from the original on 2011-07-19. ^ "Field Guide: Wyoming's Red Desert". eNature Field Guides. Archived from the original on 2011-06-14. ^ a b "Resources of the Red Desert and Jack Morrow Hills" (PDF). Western EcoSystems Technology, Inc. Center for the Wild West. Archived from the original (PDF) on 2004-04-23. ^ "South Pass City". Wyoming State Parks, Historic Sites & Trails. Archived from the original on 2008-10-26. ^ State wants to attract more visitors to railroad monument, by JODI ROGSTAD. Associated Press. December 7, 2006. ^ Ambrose, Stephen E (2001). Nothing like it in the world: the men who built the transcontinental railroad, 1863–1869. Simon and Schuster. ISBN 978-0-7432-0317-3. ^ a b "The New Fork Wagon Road: a Nineteenth Century Southwestern Wyoming Lifeline to the Union Pacific Railspur". By David Vlcek, Pinedale Field Office. U.S. Bureau of Land Management. ^ "When a boom is bust". High Country News. February 14, 2004. ^ "Red Desert's Adobe Town wins a pardon from natural gas leasing". Reddesertfiles.wordpress.com. 24 November 2009. Retrieved 9 January 2018. ^ a b "US Natural Gas: Lessons from BP's Tight Gas Facility in Wamsutter WY". June 3, 2008. ^ "BP Announces $2.2 Billion Expansion Of Wamsutter Natural Gas Field". BP press release. ^ "Jack Morrow Hills Decision Ignores Public's Request for Conservation". Friends of the Red Desert. Archived from the original on 2007-04-27. Wikimedia Commons has media related to Red Desert (Wyoming).